The Section of Epidemiology for Public Health Practice (EPHP) sponsors epidemiological, information-sharing sessions known as Epi Grand Rounds. The Epi Grand Rounds assist participants with professional development, create an informal network for exchanging ideas, and promote collaboration within the department. 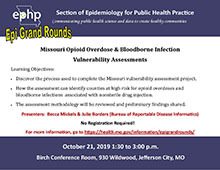 The Section of Epidemiology for Public Health Practice (EPHP) sponsors applied public health science grand rounds based on the founding science of public health, epidemiology. These Epidemiology Grand Rounds (EGR) help fulfill Public Health Essential Services #8: assure competent public and personal health workforce, #9: Evaluate effectiveness, accessibility, and quality of personal and population-based health services, and #10: Research for new insights and innovative solutions to public health problems.